Grocery shopping without money, cashiers or lines? Let’s Go…to Amazon Go! Lucky residents (and visitors) of Seattle may feel as if they’ve stepped into the future of retail shopping when visiting the first and only Amazon Go store. But, if you don’t live in Seattle, you may not have to wait too long for the ‘Amazon Go’ experience. Rumor has it that Amazon will open more Amazon Go stores in the near future. However, if you just have to know what it’s like in an Amazon Go store – right now – you can have the virtual Amazon Go experience immediately. Keep reading, and you’ll experience Amazon Go shopping vicariously through the comfort of your computer or smartphone screen. Amazon Go is a small, brick and mortar “upscale market” located near Amazon headquarters in a busy Seattle neighborhood. The Amazon Go store is open all day from 7 am - 9 pm, Monday - Friday. What’s unique about Amazon Go is its use of Amazon shopping technology (created and developed by Amazon) to allow customers to browse and shop like they’re in a normal convenience store with a few exceptions. Shoppers can avoid the regular hassles of a store – like lines, cashiers, and even ...wallets? Yes, wallets – more on that later. Now, here is the part that you’ve been waiting for. What does a real Amazon Go shopper have to say about the experience? 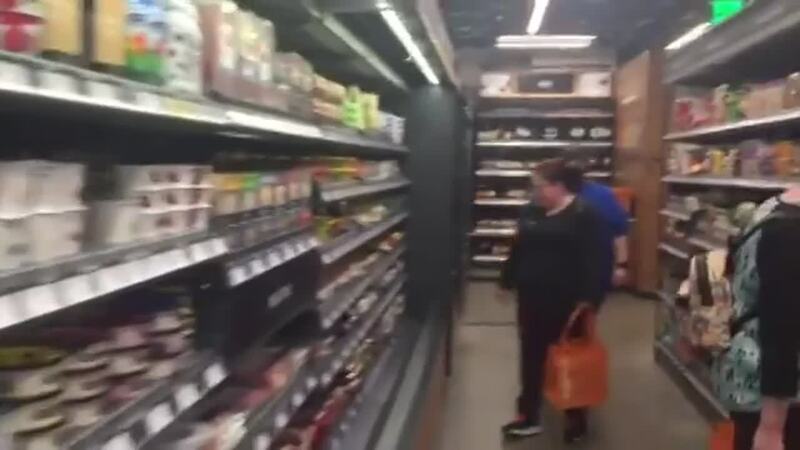 A friend of Directional Cue Content Marketing Manager Abby, UX Designer Ann Hudspeth, recently visited Seattle and made shopping at the Amazon Go grocery store a priority. Ann details her experience in a Q&A with Directional Cue. Q: What does it feel like inside the Amazon Go store? A: The Amazon Go store felt like a small high-end market that you might see in the center of a big city, like Royal Blue in Austin. It felt a little like a convenience store, but everything in it was desirable. There were a lot of yummy foods and some basic household necessities – even a small alcohol section. There were several shelves of ready-made dinners for two that you could cook at home – kind of like Blue Apron. Apparently, they are very popular. Q: How does tallying up your order work? How do you walk through the store? A: There are cameras and sensors near the ceiling and under each item. As you pick things up and put them in your basket or bag, the technology recognizes what you’ve done. To get in the store, you scan a QR code on your Amazon Go app, much like going through a subway turnstile. And, when you leave, you go back through the turnstile. Currently, you don’t get an immediate notification on your app that anything has happened. But, after about five minutes, you see that there are pending charges. About 10 minutes after that, you can see what the pending charges are. Mine were accurate! Q: What was your favorite thing about the experience? A: We met with the designer outside, and I told him that it was unexpectedly delightful to skip the entire checkout process. I’ve gone through life just accepting that shopping is in two parts: choosing the items and paying for the items. Nobody likes waiting in line and having your purchases rung up. But, in the age of the smartphone, it’s gotten more bearable to wait while passing the time on Facebook. It was nice to not have to do that, though! Q: What is the best thing you purchased? A: Amazon made a deal with Theo chocolates, and they have a sea salt dark caramel chocolate bar with the Amazon Go logo on it that I bought. It was quite tasty! Q: What do you do if you decide you don’t want something after you’ve pulled it? A: I imagine you just put it on the shelf and the technology will register that. I think they’ve tested it a lot, and there are very few errors. Q: How do you think this will affect the grocery stores of the future? A: I could see people getting used to not checking out, and seeing that as very convenient. I don’t know that the concept is scalable to a huge store, at least not anytime soon. A high-end corner store like this, though, could become more ubiquitous. Q: What kinds of shoppers and employees (if any) did you encounter? A: The only employee I saw was someone carding people to come into the corner with the alcohol. There may have been someone else at the entrance. They also had a kitchen, so you could see where they prepared the ready-to-eat meals. Q: How did you feel about walking out of a store with a bag full of stuff and no checkout? Q: If you could tell people only one thing about the Amazon Go store, what would it be? A: I liked it more than I thought I would. Q: What did you buy? A: I bought two of those chocolate bars, and I did an experiment to see if I could trip up the system! The candy bars were really flat, and they were standing upright in a box. I picked up two instead of one and put them in my bag, but I think a casual observer would assume that I just picked up one. I think there were sensors that detected the weight of the objects I picked up, or that the cameras are very perceptive because It definitely knew that I had two candy bars. Q: How does it compare to shopping at a “normal” grocery store? What was your least favorite part of the experience? A: I don’t know that I would shop there normally if I had the opportunity just because of the small number of items available. You know when you go to Trader Joe’s and realize you really need scotch tape and they don’t have it? It’s definitely a place you would stop in after work on the way home to pick up some dinner, but not somewhere you would go on Sunday to do your major shopping. A: The Amazon Go store is open to the public and anyone can download the Amazon Go app. As we know from Amazon’s potential foray into banking, they’re continuously expanding their footprint. And Amazon Go is part of that brand expansion. Amazon has already revolutionized online shopping. Through Amazon, you can completely supply a household or workplace and even obtain meals without leaving home. However, for those out and about in the real world and in need of an immediate meal or item, Amazon Go provides an option there, too (at least in Seattle). Through Amazon Go, Amazon has streamlined the in-person shopping experience as well, and they can revolutionize it the way they have the online shopping experience. Since Amazon technology has already disrupted the online shopping space, why not brick and mortar, too? Specifically, the most interesting aspect of Amazon Go is not the line and cashier-free aspect of it, but rather the extensive technology used to make Amazon Go a wallet-free experience. Not once will you have to open your wallet when you purchase items at Amazon Go. Amazon spent years developing and testing the process, and now any Amazon Go visitor can have the wallet-free buying experience. First, potential customers download the Amazon Go app and then enter the store by scanning the app on the turnstiles. Then, the magic begins with the Amazon “Just Walk Out Technology.” The store uses a mixture of cameras and artificial intelligence technology to monitor what shoppers pick up and adds the items to a virtual cart. If customers put an item back on the shelf, the app will register that, too. Later, buyers get the receipt. And just like in other apps, the credit card info is already stored, so that’s how customers get charged. What exactly is the “Just Walk Out Technology”? Just Walk Out Technology is a system that automatically updates your virtual cart. According to Amazon, it works by using a combination of computer vision, sensor fusion, and deep learning algorithms (like in self-driving cars). First driverless cars, and now wallet-less shopping. What will be next? More than likely, the Just Walk Out Technology will spread throughout the U.S. – either through other retailers who are licensed the technology or through new Amazon Go stores. The business benefits to Amazon (and others) by implementing the Just Walk Out Technology in as many places as possible are just too obvious. There will be lower overhead (no employee salaries or benefits to pay out) and employment risks. How could this technology be applied to other retailers? The Just Walk Out Technology can be very applicable to other merchants who want to offer customers a seamless experience and lower their overhead, while also keeping in stride with Amazon. It’s also possible to see the technology being adapted for many uses, including anti-theft. The licensed version of the Just Walk Out Technology could become the "Trojan horse into the brick and mortar retail space." No matter where the e-tail giant takes this software next, it’s safe to say that Amazon Go may be just the beginning of the next big thing in retail technology.